We have hand picked each item in the Menzerna Polish and Protection Starter Kit because they are highly effective when paired together. To create the best kit possible we utilize our years of detailing experience, combined with input from some of the best detailers around the country. We are confident you will get outstanding results with each item and really enjoy how your vehicle looks afterward. 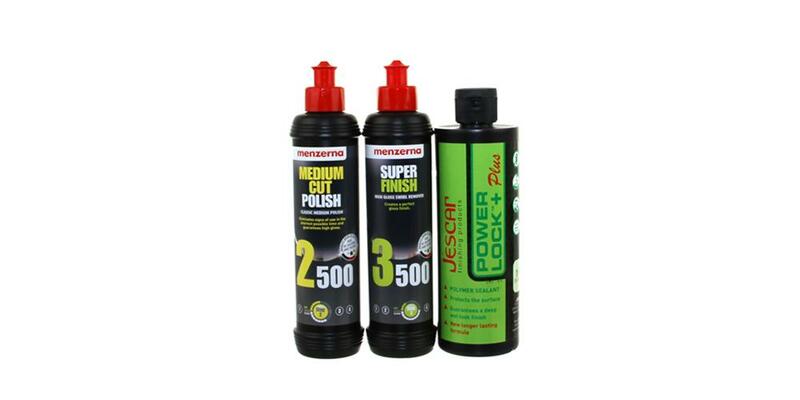 Jescar Power Lock Plus Polymer Sealant (16 oz) - shine and protection in one bottle! Menzerna Medium Cut Polish MC 2500 (8 oz) - an incredible one step polish! I love menzerna products, and these were no exception. PO83 and PO106 are a great combination for cleaning up minor defects with my Porter Cable 7424 random orbit. If you have anything you would describe as a scratch, or etched water spots, the power gloss 1000 would be a good first step instead of PO83. As far as the power lock sealant goes, only time will tell as to the durability. Finish was as good as the old FMJ, but I do miss FMJ's ease of application. The power lock is a little on the thick side (still easier than carnauba, though).